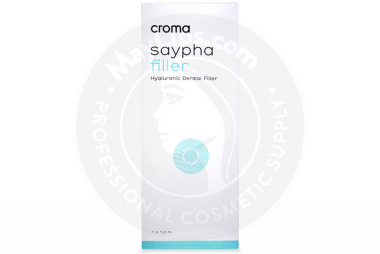 Saypha Filler is a soft tissue filler designed and manufactured by an Austrian pharmaceutical company, Croma Pharma. It is made of synthetic hyaluronic acid that is cross-linked using Supreme Monophasic and Reticulated Technology (S.M.A.R.T. ), resulting in a 3-dimensional gel structure that withstands degradation for longer periods of time. The biodegradable gel appears transparent and is highly viscoelastic. The potency of this hyaluronic acid solution, which is supplied in a 1mL syringe, is 23mg/mL. A box of Saypha Filler is sold with 1 prefilled syringe,2 sterile 27G ½” needles, and a package insert. A set of labels with batch numbers is also provided for tracing purposes. In order to protect this sterilized product, store it away from sunlight and between 2°C and 25°C. Once injected, the facial creases are reduced with a natural-looking finish. Moreover, lip augmentation can also be done using this soft-tissue filler. The aging process is distinctly noticeable on the skin. Usually, mature skin appears dry and flaky, and may be strewn with lines and wrinkles. These skin issues occur due to a decreased rate of cellular renewal and repair, as essential substances, like hyaluronic acid and collagen, do not function as efficiently as before. With this, desquamation of dead skin cells and skin injury repairs happen at a much slower rate, causing the skin to become dry and wrinkled. These skin issues are worsened when harmful free radicals, including those from external sources like smoking and pollution, attack the already weakened skin. As aging intensifies, the skin becomes drier, and wrinkles become more prominent. Saypha Filler has been formulated with highly viscoelastic hyaluronic acid that is cross-linked via Croma Pharma’s patented S.M.A.R.T. process. The resulting gel has a three-dimensional structure that provides a firm framework for the remaining tissues to cling onto. The gel is extremely robust and can endure degradation longer than other fillers on the market, while its hyaluronic acid content reduces wrinkles and hydrates parched skin. What’s more, existing collagen production is improved, providing further long-term skin benefits. With this, patients will have a reinvigorated and well-moisturized complexion, free from deep-set wrinkles. Soft tissue filler injections are a type of medical procedure, and should only be conducted by certified medical practitioners who are specialized in aesthetic treatments. Injections are actually minimally invasive procedures, and rigorous aseptic practice must be utilized throughout treatment session to reduce the risk of infection. Before injection, please analyze your patients’ medical information to ensure both their safety and suitability to receive Saypha Filler injections. As part of aseptic guidelines, sanitize the proposed correction sites carefully and assemble the sterilized syringe and needle by following the instructions on the package insert. Once ready, inject the filler gel via mid to deep dermis injection techniques, gently massaging the treated regions after injection to ensure good gel integration. It usually takes about half an hour to complete a single session. After the procedure, please inform your patients to keep the injected sites clean. They can also apply some ice packs to help swelling subside. Read the package insert before treatment session for detailed explanation on usage directions. Saypha Filler is processed using the S.M.A.R.T. synthesis, which results in a durable gel that resists rapid degradation. Once injected, patients will notice immediate skin improvements that can last for approximately 6 to 10 months. Since the gel is made of biodegradable material, it will gradually dissolve into the surrounding tissues, making it a temporary implant. Patients can opt for further injections when the initial effects disappear. Being less than 18 years of age. Read the package insert for further explanation of contraindications. Saypha Filler is a medical device with a high safety profile and tolerability. Patients may only experience minor, localized inflammatory reactions around the injection site. The effects will subside within a week with proper aftercare methods, like maintaining proper hygiene levels and applying ice packs. However, rare side effects may also occur. Please inform your patients to seek emergency medical treatment if any of the reactions are exacerbated or prolonged. Read the package insert for detailed explanations on all adverse reactions. Saypha Filler is a soft tissue injectable solution. It is made of synthetic hyaluronic acid that is cross-linked using the S.M.A.R.T. process, which creates a three-dimensional gel structure that withstands degradation for long periods of time. Once injected, wrinkles are seamlessly filled in, while dehydrated skin gets its moisture replenished.